24013 Features: -Steel reefer. -Three dome tank car. -Wide vision caboose. -24'' circle of nickel silver E-Z track. Use: -Toy. Product Type: -Train Sets. Scale: -N Scale. Power: -Electric. Age Range: -8 - 12 Years/12 Years And Up. Gender: -Boy. Color: -Multi-Colored. Generic Specifications: -Including 11 pieces curved track and 1 curved plug in terminal. Dimensions: Overall Width - Side to Side: -24 Inches. Overall Depth - Front to Back: -24 Inches. Overall Product Weight: -5 Pounds. Built originally as a mining line, the scenic value of the Durango & Silverton was quickly recognized in passenger service. After surviving natural disasters, wars, and financial instability, a determined staff (and starring roles in several Hollywood movies) promoted the tourism that ensures the line's survival to this day. Now recognized as a National Historic Landmark and a National Historic Civil Engineering Landmark, the Durango & Silverton continues to provide year-round tourist service. 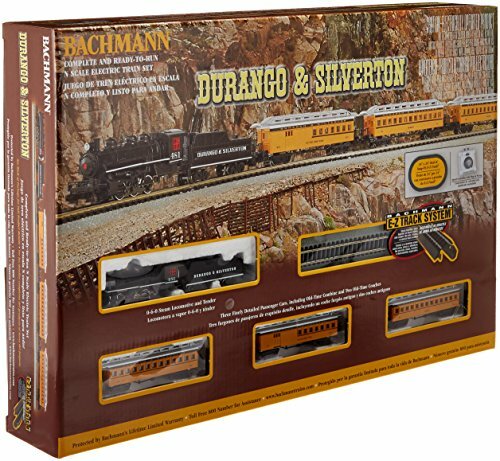 Our N scale Durango & Silverton ready-to-run set comes complete with: 0-6-0 locomotive and tender, old-time combine car, two old-time coach cars, 34" x 24" oval of nickel silver E-Z Track, power pack and speed controller. Illustrated instruction manual. 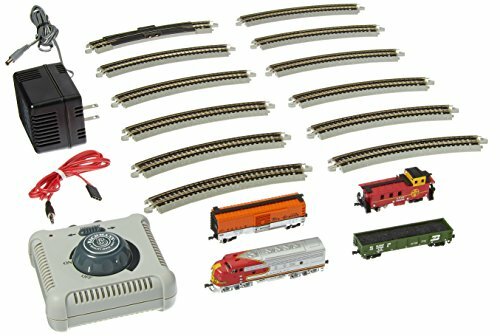 The Broadway limited ready-to-run N scale electric train set. Pennsylvania railroad’s Broadway limited carried passengers in style between new York city and Chicago for over 40 years, Starting in 1912. Rather than new York city's famed thoroughfare, it was named for the railroads “broad way," four-track mainline. With three elegant Tuscan red cars pulled by a classic 4-6-0 steam locomotive, Bachmann Broadway limited set is ready to carry on Pennsylvania railroad’s grand tradition for your N scale passengers. 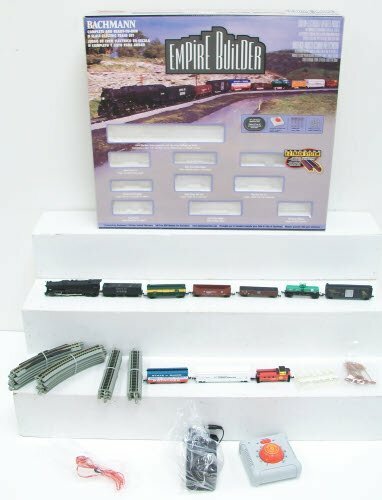 This ready-to-run train set includes: 4-6-0 locomotive with operating headlight and tender, 60’ Combine car, 60’ coach car, 60’ observation car, 34" X 24" Oval of nickel silver E-Z track, power pack and speed controller, illustrated instruction manual. 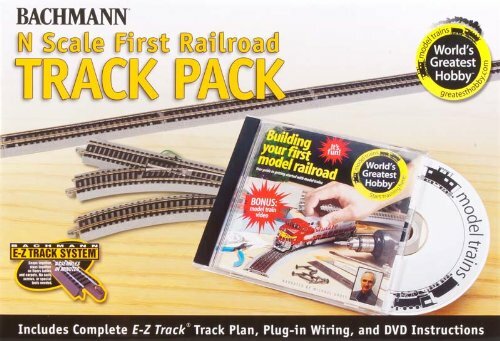 Bachmann Trains WORLD'S GREATEST HOBBY TRACK PACK - N Scale. It's never been easier to get started in model railroading. Our World's Greatest Hobby First Railroad Track Pack contains all the track you need to build 56 inches 28 inches scale track layout. Also included is copy of the DVD, Building Your First Model Railroad. Hosted by actor and model railroad enthusiast Michael Gross, this video features the construction of HO Scale model railroad with hints and tips that apply to every scale. Get on track for fun with the Word's Greatest Hobby. 47-pieces Track Pack includes: Building Your First Model Railroad DVD, hosted by actor/model railroader Michael Gross, twenty 11.25 inches curves, nine inches straights, one 10 inches straight terminal rerailer, four turnout controllers, two remote turnouts left, two remote turnouts right, two Hayes bumpers, four switch extension wires, one red 10' extension wire, two red power connection wires. Bachmann scale nickel silver E-Z Track features: snap-fit assembly, nickel silver rails for superior electric conductivity, low-profile spike heads, modeled from AAR track engineering dimensions. FREIGHTMASTER Ready To Run 60 Piece Electric Train Set - N Scale: With a 3,000-horsepower engine and plenty of pulling muscle, the EMD GP40 diesel locomotive ensures that the Freightmaster delivers its goods on time. 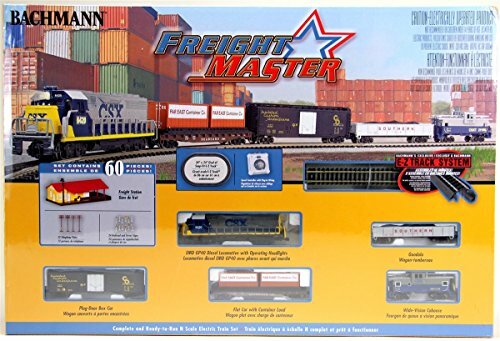 This 60-piece set includes a station, signs and telephone poles to make you master of your own freight empire! This ready-to-run train set includes: EMD GP40 diesel locomotive with operating headlight, flat car with container load, gondola car, plug-door box car, wide-vision caboose, 34" x 24" oval of snap-fit E-Z Track, including 11 pieces curved track, 4 pieces straight track and 1 curved plug-in terminal retailer, freight station, 24 railroad and street signs, 12 telephone poles, power pack and speed controller, illustrated instruction manual. 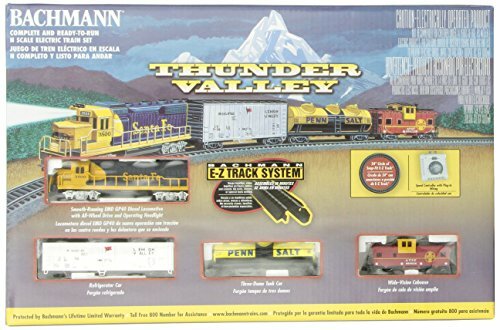 Bachmann Trains TRAILBLAZER - N Scale Ready to Run Electric Train Set. As the West developed from desolate wilderness to bustling cities, it was trains such as the Trailblazer that spearheaded America's explosive growth from coast to coast. Our 60-piece Trailblazer set with its 4-6-0 locomotive lets you experience all the excitement of the Iron Horse's journeys through the crossroads of railroading history! This ready-to-run train set includes; 4-6-0 steam locomotive and tender with operating headlight, box car, gondola car, single-dome tank car, old-time caboose, 34" x 24" oval of snap-fit E-Z Track, train station, 24 railroad and street signs, 12 telephone poles, power pack and speed controller, illustrated instruction manual. Get your Bachmann N scale starter set up and running. Want more Bachmann N Scale Train Sets similar ideas? Try to explore these searches: Wall Hanging Rods Manual Woodworkers, Flying Spur, and Geneva Buttons.